You are browsing the Blog for Academics. If you would like to take the Logic Pro X Apple Certification Exam, Ex’pression is offering you an opportunity to take it at a significant discount in support of your continuing education. This is a one-time offer, take advantage of it and get certified in LPX! There are no restrictions or prior requirements of who may take this exam. Note: If you are a current Interactive Audio or Sound Arts student that has not yet completed CMP 1, you will take this certification in your class. You may ignore this message. The exam will take place at 4pm on May 13th, 2014 in the McLuhan classroom at Ex’pression College in Emeryville. Upon arrival, please sign in at the security desk located at the main entrance. The LPX Certification Exam comes directly from the Apple Training Series book, titled: Apple Pro Training Series: Logic Pro X: Professional Music Production. The text is available from local books stores, libraries, and online. This title is also available from Creative Edge, Apple iBooks and Kindle books. The information found in the book is the only material you will find on the exam; if it is not found in the book, you will not see it on the exam. The following ID must be created before you may take the Exam. You must bring your PEARSON Username and Password to the Certification Exam. There will not be time to register on the day of the Exam; this must be done before you arrive. Write down your Username & Password and bring them to the exam. New users please sign up: Create a web account. for the amount of $75. Please contact Chris Colatos at ccolatos@expression.edu with any questions. Student Coach is now available! 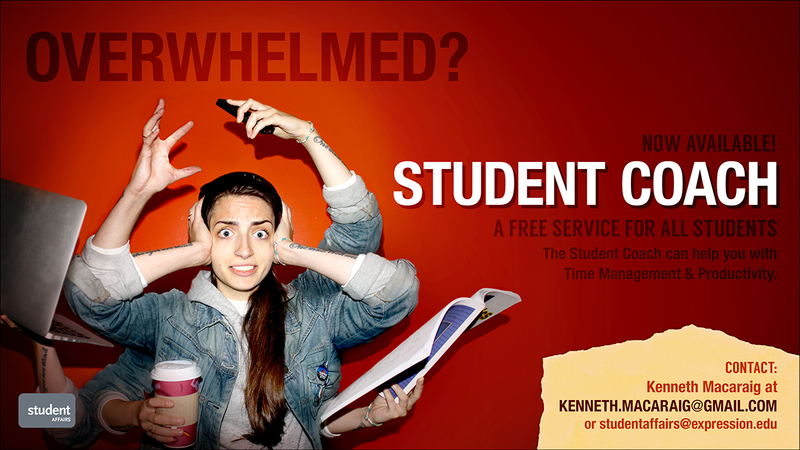 Read more about it on our Academic & Support Services! Want to reinforce and build your own skills? Interested in teaching in the future? Comments Off on Seeking Tutors! Earlier this year we said that General Education Courses would come on-ground (on campus) for at least two terms. During the time on-ground we have learned about the importance for some students to have face-to-face time with their instructors in a classroom setting. We have heard and seen that students, staff, and faculty enjoy the social experience in which we are seeing that Instructors build a stronger connection with the students. 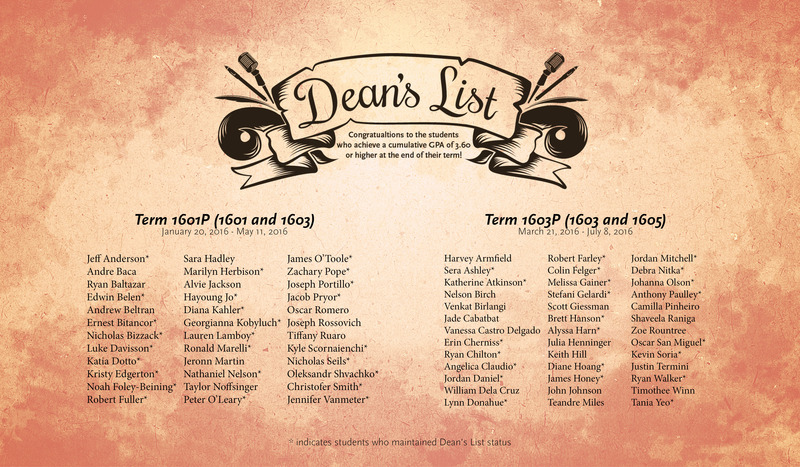 The result is that more students are succeeding in their courses. This has been taken into account as we began working to redesign the courses with our new online learning platform. With your academic success in mind the General Education Courses are to be delivered in a blended or hybrid delivery format. A blended format combines online and on-ground delivery throughout the term. For our General Education courses, three weeks where on-ground sessions will be held at each campus. Attendance is required for the on-ground sessions. 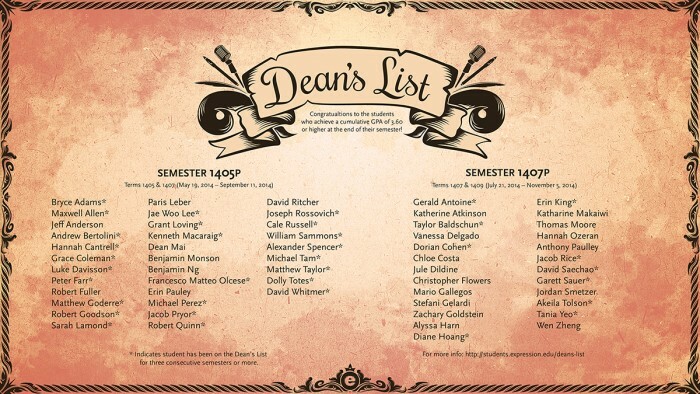 These sessions are scheduled for the first and last week of the term and the middle of the term. The remainder of the course is online and requires several interactions in order to be marked present for those weeks. Details will be online and reviewed by the instructor for each course. We are launching the first course to have gone through the redesign for blended delivery this coming term. Critical Studies: Analytical Writing and Literature is the first course using the blended format. If you are registered for that course you will get an email from Carol Treadwell, the Course Director. Orientation to Canvas, the online platform, is scheduled for the first day during week one. Yes, this means all other General Education courses remain fully on-ground for at least one more term. Some will be on-ground for two more terms. I will send out another email to you announcing the courses and their blended launch. Your cooperation and patience during this process is appreciated. If you have any questions please let me know. We are scheduling student forums during the next term and look forward to feedback and questions. Sound Arts/Interactive Audio Drop-in Tutor Hours: Update! 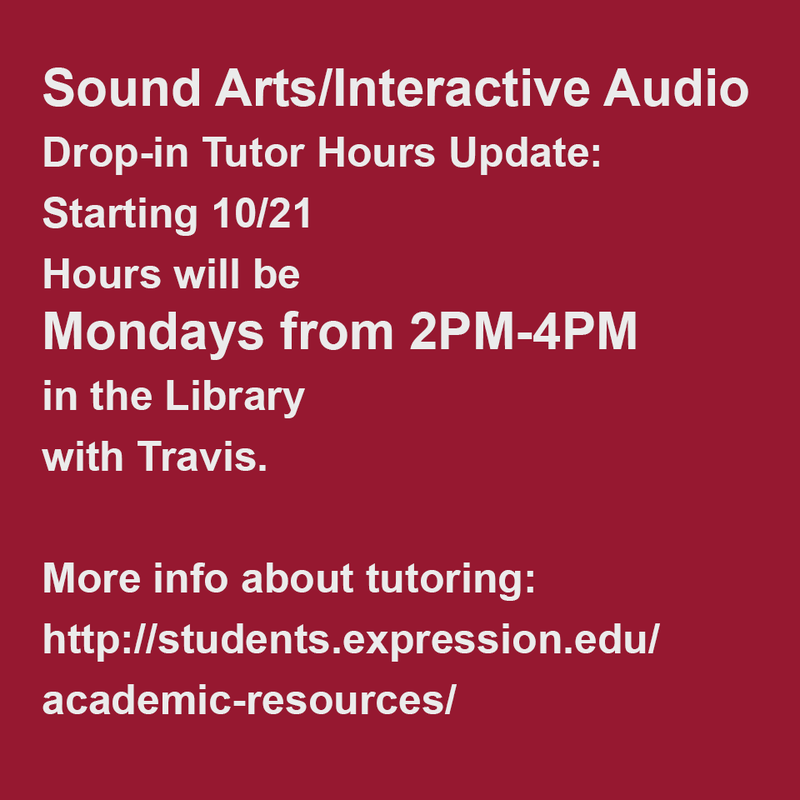 Sound Arts/Interactive Audio Drop-in Tutor Hours Update: Starting 10/21, Hours will be Mondays from 2PM-4PM in the Library with Travis. Comments Off on Sound Arts/Interactive Audio Drop-in Tutor Hours: Update!